The recent release of the Scottish national budget is being overshadowed by a revelation that the Scotland’s leading government party secretly abandoned its only independent tax power, leaving the country with no tax autonomy for at least two years. Last week the Scottish National Party (SNP) revealed the country’s budget for the upcoming year. However, the announcement was marred when a round of in-Parliament questioning led the Finance Minister to disclose that the Party opted to forgo the opportunity to keep the Scottish Variable Rate (SVR) system, without consulting or informing the national Parliament. Under current regulations, the only autonomous tax revenue raising power the Scottish Government can exercise is the SVR, otherwise known as the “tartan tax”. The rule allows Scotland to raise or lower the national personal income tax rate by 3 percent from the level set for the UK by the HM Revenue & Customs (HMRC). However, to use the SVR Scotland is required to pay the HMRC GBP 50 000 annually to receive a comprehensive list of Scottish taxpayers and their incomes, and maintain infrastructure capable of administrating the variable tax rate. Although the system has not been invoked since it was granted in 1997, it is estimated that using the SVR to its full extent could raise Scottish national tax revenues by GBP 1 billion annually. Upon release of the Scottish budget, the Finance Secretary John Swinney stated that the SNP had decided not to exercises the SVR. However, when pressed by opposition parties to utilize the tax power, John Swinney revealed that the SNP had opted not to pay the HMRC earlier in the year, and that the Scottish tax authorities would be required to upgrade their existing infrastructure before the system could be implemented. Under the current situation, it will be at least two years before Scotland will be potentially able to utilize its SVR powers. The time frame extends beyond the upcoming May 2011 elections, regardless of which political party comes into power. The weekend following the announcement has seen significant criticism leveled at the SNP and its decision to forgo the SVR power without any parliamentary consultation. Andy Kerr, prominent Scottish Labour Party MSP, has accused the SNP of “sabotaging devolution,.” He added that “…the refusal of ministers to commit resources so that HMRC can collect the tax is unbelievably short-sighted.” Tory Party MSP Derek Brownlee regarded the SNP’s move as “nothing short of astonishing”. Calls are now being raised to investigate John Swinney’s behavior throughout the budgetary announcement, as he initially gave no indication that the Government had lost its only autonomous tax power, with some even going so far as to say that he deliberately mislead the Scottish Parliament and the Scottish people. 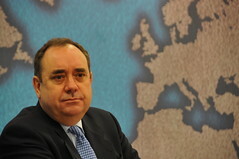 Since the initial negative comments were made, First Minister Alex Salmond retorted, saying that there were absolutely no misleading statements made by John Swinney, and that the SNP has always been opposed to the SVR system, so the move should not have been a surprise to any party.